Polish Army of Duchy of Warsaw was organized from the beginning in horrible rush and in some provisional way. In its short history it had several waves of recruits and volunteers, which meant enormous enlarging both officer's corps and mass of soldiers. In years 1806-1807 the wave was various. Additionally to the legionnaries "coming back from the Italian land to the polish land" there were attending officers and soldiers of former Polish Army of Polish Kingdom, who were called by the Prince Józef Poniatowski - cousin of the last Polish King. There were also gathering to Polish Army of Duchy of Warsaw officers of the Prussian Army, that were fighting against the French Army at Frydland. There was gathering also the youth of noble families, which were both full of patriotic eager and willingness of adventure and were joining to the staff, regiments of chivalry and regiments of artillery. In 1809 to the lines of Army of Duchy of Warsaw were coming Poles from Galicja, Wołyń i Podole, who both went through the cordons and risking its life as well as properties, and not being sure if they would see their families next time. They were composing the cadre of formed from may of that year "Galician-french Army", that was after the treaty of peace joined into the Army of Duchy of Warsaw. Third wave, that was not as big as two of the past, was noted in the spring 1812 - before the final game of France and Russia. At that time there were enlarged existing squadrons and battalions. 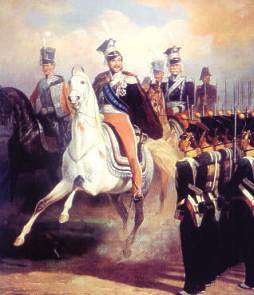 In summer 1812 there were formed new regiments of infantry and chivalry in the Lithuania. Finally last wave of patriotic sacrifices was carried out in the winter of 1812/1813, when after the defeat of the expedition to Moscow, there was formed polish corps of 20-thousand and as we can say confirm again words of Mazurek of Dąbrowski (hymn of Poland). Army of Duchy of Warsaw in its mass of officers was built up on the volunteers recruitment, that provided to it high level of national consciousness, patriotism and eager to sacrifices. Soldiers from times of Duchy of Warsaw was taken from the recruitment and mostly was a peasant. But there were also represented - especially in regiments of the chivalry - sons of poor noble families (mostly from Mazovia and Podlasie regions). The peasant was recruited in the beginning without the eager. They were not conscious about the purposes of the fight and what was the diffrence between this Army and Army of occupants. nevertheless step by step - mostly thanks to the legion's traditions - the Army became for the recruit the school of patriotism. Despite to the big social differences, poverty, struggle and harms it allowed them to understand that Duchy of Warsaw provided them new values: self freedom, possibility of the military career and perspective of reaching work in government administration. It were the reasons of reducing the frequent in the beginning desertations and soldier-peasant served devoting himself and with sacrifices - defended without receiving the pay for many months. In the Duchy of Warsaw there existed in the beginning characteristically for that times group of soldiers that was fighting for different flags and polish uniform wore rather by accident. Mostly this case concerned either prussian recruits or russian captives, that had been captured in campaign 1807. this soldiers weren't asked for permission and recruited because of the lack of the our own recruits. Because of the fact, that they neither fought with eager nor avoided deserting at the first opportunities. All those, who did not feel themselves associated with new state all those were set free in 1808. During the galicia's campaign there joined several thousands of Poles from the Austrian Army, who as for example were changing the side with the whole company. Poles, who were captured by the French they were joined and went back with regiments far over the Pirenees. At the end of autumn of 1813 there were recruited Poles captured as either russian or prussian or austrian soldiers, who had been kept in french camps for captives.